Can you Reheat French Fries? | Can You Reheat? Can you Reheat French Fries? I love to go to restaurants and order a huge burger and a side of fries. I always feel like I need to eat the fries while they are fresh because microwaved fries are soggy. Is there a way to reheat them without them being soggy? Yes, there are two easy ways to keep your fries fresh and crispy! If your fries are topped with chili and cheese, or any topping (other than seasoning), you should stick with the oven. Otherwise, for revitalized French fries, a dip in the deep fryer makes them oh so delicious. On a baking sheet, lay out a sheet of aluminum foil, big enough so the fries will be in one layer. If topped, ensure the mass is in the middle of the foil. Bake at 375 degrees F for 10-12 minutes, or until they are heated through. You should be able to smell them when they are getting close to done. At that point, you can pull them out, or let them go for another minute or so to get crispy. Just be sure you don’t burn your toppings. By far the best option for reheating French fries is too deep fry them again. Simply heat the oil to the “French Fry” setting, or whatever the middle setting is on your fryer. It will vary from around 350-400 degrees, depending on the model. 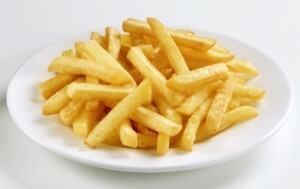 Load your leftover fries into the basket, allowing room for them to move around some in the oil. Add to the oil and close the lid. They will need about five minutes to be fresh and crispy again. Drain the fries and dab them with a paper towel to remove the excess oil, season, and enjoy! French fries are staples no matter where you go; they always seem to be there. So instead of throwing them out since other methods have rendered soggy results, use the oven or the deep fryer to enjoy them for yet another day! I always reheat any deep-fried leftovers in an ungreased waffle iron. It’s very fast and the food does not get soggy. The waffle shape/pattern may be something to get used to for some, but my kids love it!